Technē’s Paradox—a frequent theme in science fiction—is the commonplace belief that technology has both the potential to annihilate humanity and to preserve it. 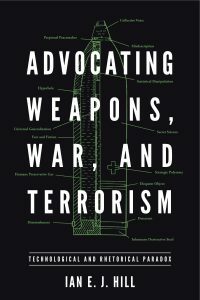 Advocating Weapons, War, and Terrorism looks at how this paradox applies to some of the most dangerous of technologies: population bombs, dynamite bombs, chemical weapons, nuclear weapons, and improvised explosive devices. Ian E.J. Hill is Assistant Professor in the History and Theory of Rhetoric at the University of British Columbia and an affiliate faculty member of the Graduate Program in Science and Technology Studies.